A simple wooden wall sign for basic messages, requires attaching to a wall. The Wooden Wall Sign lets players display a short message to other players. Edit the text as many times as needed with the use key (e, , ). To add a second line of text, use <br>. Wall signs attach directly to the face of walls, but do not snap to any structures. Care must be taken during placement as the texture of the wall behind can protrude through the sign itself. The Wooden Wall Sign is treated as a wooden structure and can not be damaged by hands, stone weapons, or non-explosive ranged attacks. 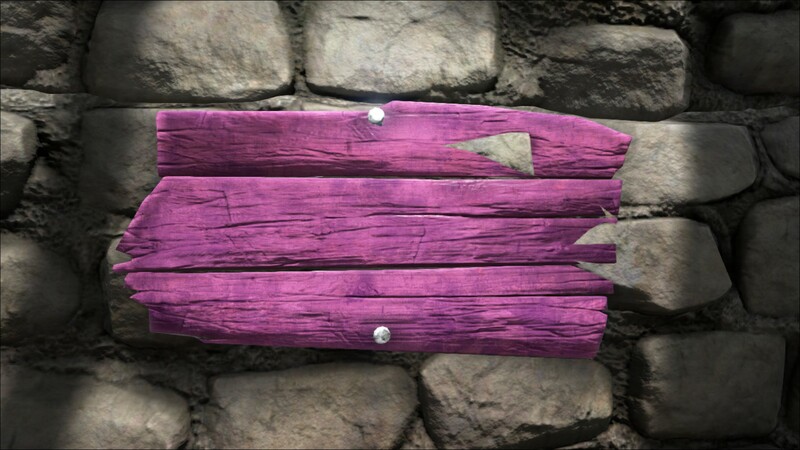 In addition to its preset paint regions, you can doodle on the Wooden Wall Sign by "attacking" it with a Paintbrush, which will open the "Apply Paint" Menu. Then, click and drag your cursor over the 3D model (like a paintbrush) to draw anything you want. See Painting for more information on doodling. To load Ark PNT files into a Wooden Wall Sign, the file name must be suffixed with _Sign_Wall_Wood_C.pnt. The resolution is 128x128, and the aspect ratio in-game is 2.5:1. Also see Painting. This page was last edited on 26 March 2019, at 21:22.